In order to fulfill the ever-evolving demands of our esteemed clients, we are engaged in providing an optimum quality array of Herbarium Press. MDF planks. Nicely painted. Provided with tilting type bolts & fly-nuts for putting sufficient pressure. Size: 45x30cm. Carrying handle. Teak wood batons fabrication. Adjustable strap for putting sufficient pressure. Spirit polish finished. Heavy duty wooden planks finished in paint are used as pressure plates. Provided with fly nuts for putting sufficient pressure. Size 45 x 30 cms. MDF Planks. Nicely painted. Provided with tilting type bolts & fly-nuts for putting sufficient pressure. Being a prominent name of the industry, we are manufacturing a commendable and sophisticated assortment of Herbarium Press for Field Use. 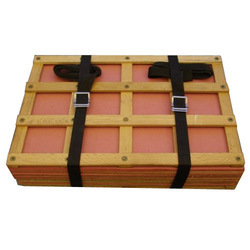 Herbarium Press - Heavy duty wooden planks finished in paint are used as pressure plates, provided with fly-nuts for putting sufficient pressure..